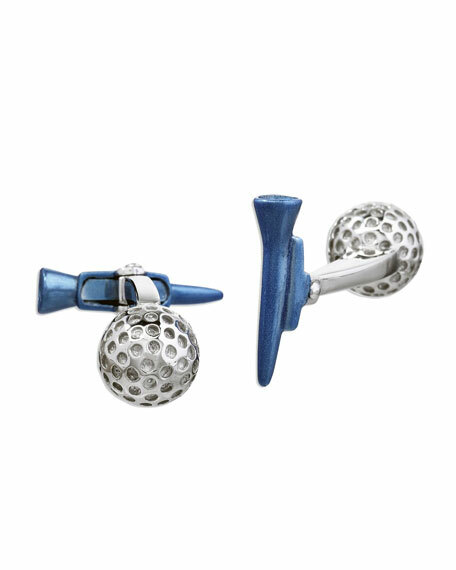 Sport these golf-inspired Jan Leslie cufflinks on the course or just while relaxing and enjoying a cocktail at the club. Sterling silver cuff links with hand-painted enamel. Golf ball fronts and with blue enamel T-Shirt backs. Jan Leslie designs a collection of cuff links, tie bars, and collar stays featuring vibrant hand-painted enamels and striking semiprecious stones. The designer draws inspiration from her diverse background (which includes studies at the Wharton School of Business, consulting at a premier accounting firm, and attending Parsons The New School For Design) for her artisanal interpretations. For in-store inquiries, use sku #896034.